Powered by veggies and farmer cheese! 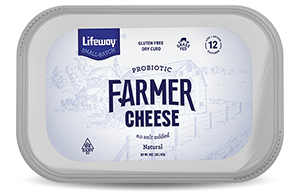 Break out of a lunch rut with the ultimate stacked vegetable farmer cheese sandwich: start with a layer of our high-protein farmer cheese and then pile it high with endless layers of fresh vegetables for flavor, texture, and nutrients in every bite. Prebiotics are non-living, non-digestible carbohydrates naturally found in a variety of foods. Your body actually can’t digest prebiotics, so they’re what probiotics feed off of to remain actively working in your digestive system. They help the digestive system by promoting the growth of good bacteria. Prebiotics and probiotics work together in balance to make sure our digestive system stays on track and regular. Research has found that consuming a variety of prebiotic and probiotic food sources may improve your body’s natural functions, including both your immune and digestive system. Probiotics are live microorganisms that may provide health benefits when consumed in adequate amounts. The benefits of these good bacteria may include supporting immunity and a healthy digestive system. Probiotics are “good” bacteria. They are live microorganisms similar to the ones already living in your gut and may offer health benefits when consumed in adequate amounts. The word “probiotic” itself is often translated to “beneficial for life.” It is a derived from the Latin word “pro” meaning “for” and the Greek word “biotic” meaning “life.” Probiotics can help balance the microbiome by replenishing the good bacteria, which may lead to improved digestion and better immunity. Spread farmer cheese evenly over the two slices of bread. Assemble the sandwich with a layer of each vegetable.